On June 3, 2011, I found myself at Namugongo, the National Shrine to the Ugandan Martyrs, with over a million pilgrims to celebrate the martyrdom of St. Charles Lwanga and his companions. It was no accident; my trip to Africa was timed so that I could be present at this holy place. The Shrine is built in the style of a traditional African hut, honoring the culture of the martyrs. The relics inside bear witness to their great faith. In the center of the Shrine under the main altar, which is the exact spot of Charles Lwanga’s heroism, hangs a portion of his ashes. Charles and his companions were burned alive because they refused to renounce their Christian faith and pledge allegiance to the king. Besides the obvious sacrifice, what made this story fascinating to me is that these Martyrs were really boys at the time – most of them in their teens – as they were bound and paraded to their death. With their parents calling to them to renounce their faith, taught to them by missionaries, these boys prayed aloud and even sang as they were tortured, while their killers lit the pyre that would be their fate. To this day, people walk, some of them literally across Africa, to be at the Shrine for the Martyrs’ Feast Day, honoring the Martyrs’ own march. My faith has long called me to be a witness to their walking. These days, there is still much walking being done in Africa, this time to escape another horror. 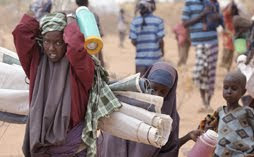 Famine has become the great torture of the people, forcing them to flee Somalia in great numbers towards refugee camps in Kenya. Our National Director of the Pontifical Mission Societies in the United States, Fr. Andrew Small, OMI received word from his Kenyan counterpart, Fr. Celestine Bundi, that the situation in the camps is desperate; Fr. Celestine is asking for help for the many local priests and sisters serving in the affected areas. To contribute online, go to our website, www.propfaithboston.org and click the Donate Now button. Please join us as a witness to their walking. For many years, Catholics have followed the custom of enrolling themselves or their loved ones, living or deceased, in Membership in The Society for the Propagation of the Faith. By doing so, they give an ongoing gift to member and the missions. Membership means the person enrolled receives the spiritual benefits of Masses said daily by mission priests; they are also included in the intentions of a daily Mass celebrated at the Vatican. In many mission locations, funds from Society Memberships are a substantial means of support. One such place is Tena, Ecuador. Part of the Vicariate of Napo, Tena is home to the only means of regular catechism for many Catholics in the area – a radio station. Every day, the faithful listen to everything from religious music to the Mass itself. For many, it is the only Mass they can attend due to the long distances between parishes. Your support, in a direct way, brings the Faith to thousands. For more information on Society Membership, please call 617-542-1776 or email info@propfaithboston.org. Andreas Makris; Rev. Aloysius Blonigen, C.M.M. ; Sgt. Raymond Plouhar; Milena Mora Del Valle; The Petrozzelli Family; The Spears Family; The Gallagher Family; Sr. Mary Esther Owens, OP; JohnT.Bowers, M.D. ; Helen F. McDonald; Archbishop Pietro Sambi; Carol Elizabeth Plumer; Eric & Cathleen Adams &Family; The Leo J. Dunn Family; Jason T. Pool; Ellen & Dino Canesi; Robert Sargent Shriver, Jr.; James Kilpatrick; John J. Amaral; Bill Millin; Kenny McKinley ; Hershel Alpert; Dodge Morgan; Julio Andrade; Duke Snider; Bobby Thomson; George V. Bell; Dorothy V. Doane Alderson; The Zeller Family; Michael J. Hurley; Pauline P. Orford; Brother Norbert Hasenmuller, O.S.I. ; Eldon Auker; Tracy Zeller ; Rev. Richard DeVoe, M.M. ; Raymond, Donald, Roy, Jean & Jeanette Durand; Bishop Gabriel Montalvo; William G. Bastedo; Phyllis Letendre; The McCoy Family; The George W. Bell Family; Helen D. Igo; Cecile Powell; Elaine M. Freeman; Michael & Laura Bradley; Mary Lou, Herve and Brian DesRosiers; Joan E. Staford; Barbara, Robert & George Waters. The Archdiocese of Boston has been blessed over the years of its existence to be the “springboard” for the foundation of several missionary communities. One of those missionary communities is the Sons of Mary located in Framingham, Massachusetts. Fifty-nine years ago, Father Edward Garesché, a native of St. Louis, Missouri, founded the Sons here in Boston and placed them under the patronage of Our Lady, Health of the Sick. Since their foundation in 1952, the Sons have been dedicated to missionary work among the poorest of the poor. Their work has taken them from the mountains of Peru to the jungles of Venezuela to the inner city streets of Manila. The community is made up of both Brothers and Priests, many of whom have degrees in social work and health care. According to their website, Father Garesché sought out “young men of strength, constancy and sacrificial spirit who love God and His Blessed mother and are zealous for the healing of bodies and souls to such an extent that they will forget themselves and work with untiring devotion.” (http://www.sonsofmary.com/). 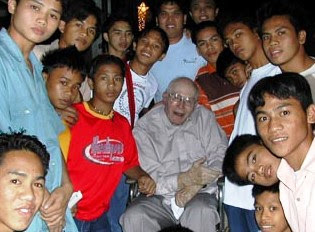 In 1984 the Sons opened a new mission in the Philippines that has focused in large part on “street children,” estimated to be in the neighborhood of fifty thousand kids. In 1989 they opened the Pangarap Shelter in Pasay, one of the toughest neighborhoods in Manila. Pangarap, the Tagalog word for “hopeful dream”, has ministered to the social, educational, legal, psychological, spiritual, recreational, and medical needs of these children and has provided a safe haven for these “street kids” who otherwise would have been left to their own devices for survival in a dangerous and predatory environment. This year, parishioners in Immaculate Conception Parish in Everett, Saint Rita Parish in Lowell, Saint Mary Parish in Randolph, and Saint Theresa Parish in Sherborn will welcome a representative from the Sons of Mary as their parish participation in the Mission Cooperative Program of our office. Father Garesché envisioned that his religious community would be “a blessing for the whole world.” This indeed has been the case. Thank God for the witness and ministry of this dedicated group of Priests and Brothers who labor to address the spiritual and physical needs of those to whom they are sent. For more information on the missionary work of the Church, please visit our website: http://www.propfaithboston.org/.